Since the Toyota GT86, the Scion FR-S and the Subaru Boxer were introduced, the tuner crowd around the world has been clamoring for higher performance variants of the new Japanese rear drive sports coupe and while it doesn’t pack any more power – the new Toyota GT86 TRD carries a more aggressive design that could eventually come to those Toyobaru coupes sold in the US. We have already seen various exterior dress up options for the Toyota GT86 along with the Scion FR-S and the Subaru BRZ but UK Toyota is the first brand of the Japanese automaker to feature one of these new sports coupes with a full factory-added Toyota Racing Development (TRD) package. Unfortunately, the Toyota GT86 TRD doesn’t include any performance bits but this new sport exterior package doesn’t hurt performance through the additional weight that you get from some body kit packages available in the aftermarket. That being said, the GT86 TRD offers the same performance capabilities and the same flawless weight distribution as the “normal” production models but with a unique, aggressive design. 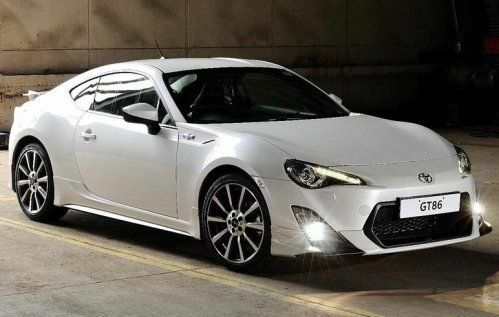 The Toyota GT86 TRD for the British market is predominantly an exterior package that begins with a vastly more aggressive front fascia with a lower lip that sharply angles outward while contrasting gloss black paint really makes this package look great in white as is shown on the right side (although the TRD package can also be ordered in GT86 Black). Along the sides, the GT86 TRD package adds side skirts that extend further down, working with the 18” cast TF6 alloy wheels to give GT86 a meaner, more race ready stance. Finally, the back end of the TRD package wears a special rear diffuser that wraps around unique quad tip exhaust that is expected to add some sound – but not some performance. Inside, the GT86 TRD gets a TRD branded shift handle while the engine also sports some TRD badging on the radiator cap. The press release also talks about a TRD fuel filler cover but the images of the new package clearly show a normal gas door so perhaps the GT86 wears a special gas cap…although that isnt very exciting. Gas cap aside – the GT86 TRD looks great with this new body kit without being “too much”, which is often the case with aftermarket body kits. Like the non-TRD Toyota GT86, this special limited edition sports car is able to dash from 0-62 in 7.7 seconds en route to a top speed of 140 miles per hour with the manual transmission while the self shifting models hit 62mph in 8.4 seconds with a top speed of 130mph. While performance isn’t hindered, the emissions and fuel economy figures do get a little worse but so long as the performance is still there – who really cares about a minute fuel economy drop? If you are that worried about fuel economy, you should be buying a Prius from your local Toyota dealership and not a rear wheel drive sports coupe. Production of the Toyota GT86 TRD model will be limited to just 250 units and a hefty price tag may also prevent the average GT86 buyer from running out to order the special TRD setup. We should keep in mind that cars cost a great deal more on average and while the Scion FR-S carries a base price of $24,500 in the US, the standard GT86 starts around $39,500 with current currency conversion rates on the British Pound. With that $15,000 price difference between the American FR-S and the British GT86, the $50,000 ($49,334 USD with conversion rates for the manual transmission model) price tag of the GT86 TRD really isnt as bad as it sounds – although a $15,000 body kit and wheel package would likely be a hard sell for both Subaru and Scion in the US market. Unfortunately, there has been no word on availability of something similar to the UK-bound Toyota GT86 TRD package for other markets but with the massive popularity of the Scion FR-S, the Subaru BRZ and the Toyota GT86 in other (non-UK) markets – I would very much expect sportier packages for the US markets in the near future. Especially in the case of the Scion brand, the company has always been quick to point out how much factory customization is available so if Toyota Racing Development can put together body kit/wheel packages that don’t add weight and reduce performance, it seems logical that at least Scion would have some sort of full body kit package available for the awesome FR-S.